Our Mission | MediVision Inc.
Minimally Invasive Optics for your every need. MediVision was established in 1994 to develop minimally invasive surgery devices. The optical engineering team at MediVision has streamlined and simplified endoscope manufacturing with its innovative approach to design. Our custom endoscopes have provided many surgeons with instrumentation that the larger companies could not or would not make. Keeping with this spirit of finding solutions to your problems we always encourage our users to make suggestions and comments for the improvement and design of our endoscopes. Our R&D department has extensive tele-video capabilities as well as a superior optical engineering staff. 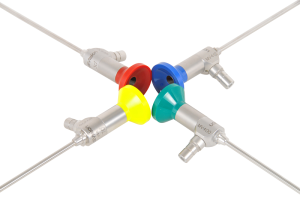 Technicians have extensive experience in manufacturing, designing and repairing custom endoscopes as well as common models. This year MediVision has decided to introduce its own USA manufactured endoscopes that incorporate some of the custom designs we have developed over the years. It is our hope to provide the surgeon with the ultimate optical system for new HD cameras at the best value possible. MediVision is here for all of your endoscopic needs.